World Sevens Series champions South Africa will step up their preps for the forthcoming HSBC Sevens Series in October when they take part in the Assupol International 7s tournament in Stellenbosch, South Africa. The tournament, which was launched in Stellenbosch on Thursday, will see South Africa in action at the Markotter Stadium on 28 and 29 October with fellow World Series contenders Scotland and Kenya, as well as the national sides of Zimbabwe, Namibia and Mauritius, and the England Academy Sevens team. Kenya Sevens has since kicked-off their preps upon re-appointment of Geoffrey Kimani as strength and conditioning coach. 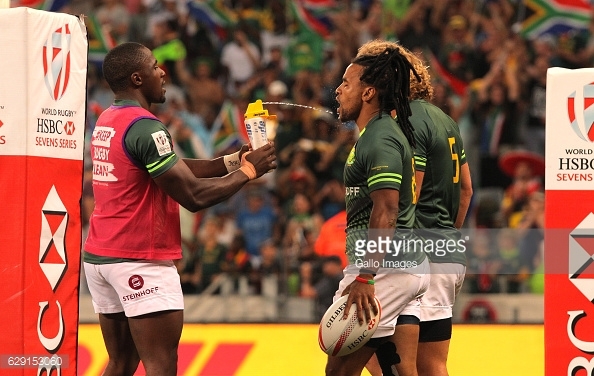 Springbok Sevens coach, Neil Powell, said this was an ideal opportunity to fine-tune their preparations for the 2017/18 HSBC World Rugby Sevens Series, with the first of those tournaments, the Dubai Emirates Airline Sevens, to be played a month later. “The timing and venue of the tournament could not be better for us,” Powell said. A number of players who helped the Blitzboks to win the series in 2016/17 are currently involved in Currie Cup rugby and Powell feels the Assupol International 7s will be the perfect opportunity for them to get back in the sevens swing of things. “You can train as hard as you want, live matches are still the best way to improve your game and test new things,” said Powell. Powell also confirmed the departure of regular Strength and Conditioning Coach, Allan Temple-Jones, who has taken up an overseas offer. “’TJ’ has been with the squad for more than 10 years and has been a core member to our successes,” said Powell. “He was part of both South African teams that won the series titles – last season and in 2009 – and that in itself is testimony of his ability. You can also add the gold medal at the Commonwealth Games and bronze at the Olympics Games to understand how successful he was. South Africa will also send a team to the Octoberfest Sevens, to be played in Munich on 29 and 30 September. The squad and management team for the trip will be announced later. The Assupol International 7s will host an international section with South Africa, Scotland, Kenya, Namibia, Zimbabwe, Mauritius, All Stars and England Academy competing. An international Under-17 tournament, where Argentina, Namibia and South Africa are amongst the participants, will also be held, supplemented by a Western Province club tournament.